I love it and there are more photos of it here KarinB on my Ravelry profile. 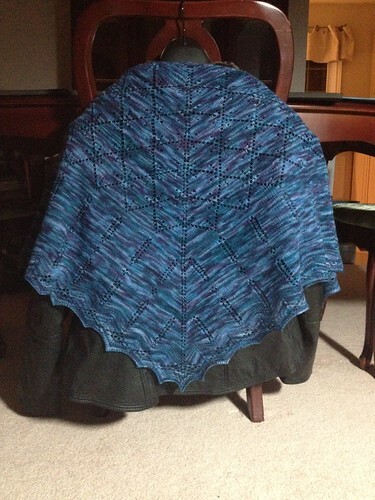 I also managed to block another shawl. I did. I know! 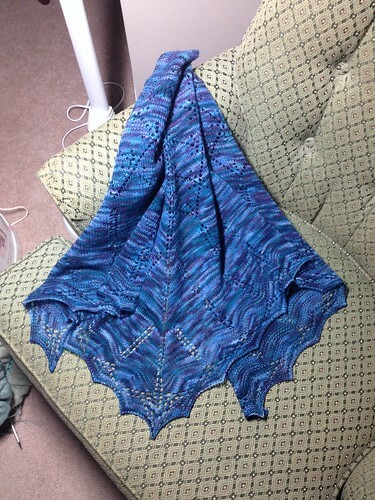 My Père Lachaise Shawl, the 2013 Tour de France project designed by my friend Natalie Servant, is finally wearable. I wouldn’t normally pair a variegated yarn with a lace pattern but there was so much stocking stitch in this design, I thought I’d use up a little bit of stash. I also made a huge pot of spaghetti sauce and cooked up a ton of gluten-free fettucine to make my lunches for the week, as well as cheese omelettes for my breakfast. That and an evening out with a friend Saturday night to a local pub to see two really talented and entertaining bands made for one very good weekend. This in spite of a cold that kept trying to spoil my fun. Ha! Take THAT (swallows more Advil Cold & Sinus) evil cold germs. I’ll spare you pictures of the food – that’s what Instagram is for! 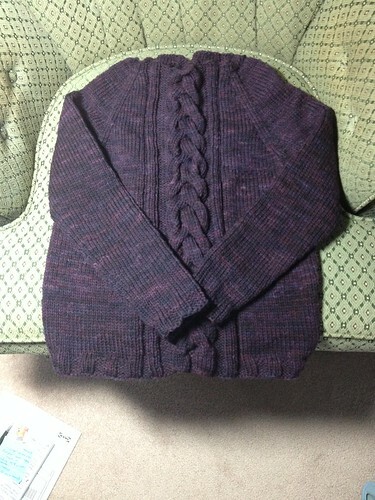 This entry was posted in Knitting, Knitting Clubs and Knitalongs, Life and Stuff, Music, Projects, Scaves and Cowls, Sweaters and tagged Jennifer Wood, Lace Projects, Malabrigo, Morisot, Natalie Servant, Pere Lachaise Shawl, Sweaters, Sweet Paprika, Tour de France KAL 2013. Bookmark the permalink.